After a year-long absence, veteran journalist Tina Monzon-Palma made her much anticipated return to the anchor desk Monday night. The anchor of ANC's venerable evening newscast The World Tonight was all business as she whipped through the biggest news of the day alongside her co-anchor Tony Velasquez. "Look who’s back in the newsroom and on our air beginning tonight!!! 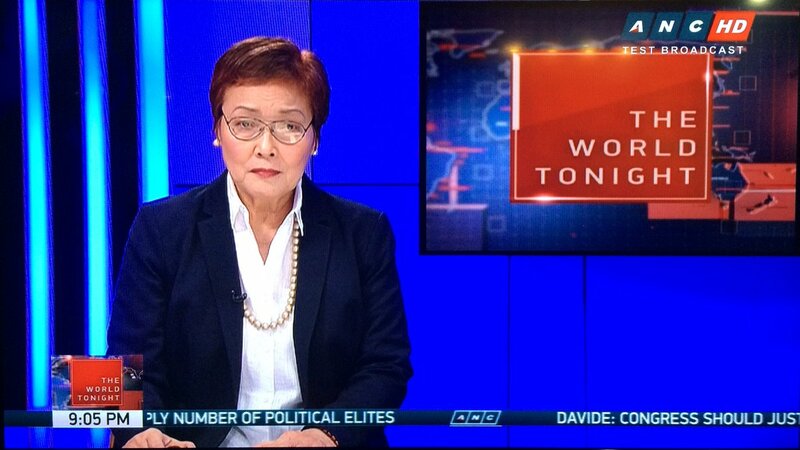 Tina Monzon Palma delivers the news again in The World Tonight on ANC," ABS-CBN News Chief Ging Reyes tweeted Monday just as the program was getting started. Monzon-Palma took a sabbatical from her anchoring and hosting duties at the Kapamilya News Channel in January of last year. Aside from Velasquez, a number of ANC anchors — like Cathy Yang, Nancy Irlanda, Ron Cruz, Christian Esguerra, and Karmina Constantino — stepped in for her on TWT and on her public affairs program Talkback. Since then she was away from the limelight and would only make a rare appearance in August during the Gawad Plaridel Awards 2017 ceremony, where she was honored for her more than four decade career in television news.